We spend a lot of time in the house. Me, because I have to; Chimp, because he’s taking care of me, and because he likes to be around me. So we have been working on making it a pleasant place to be. Before we moved to Pennsylvania, we didn’t spend much money on house stuff. We’d lived in a series of apartments the entire time we’d been together, and we had more than enough stuff to furnish an apartment. We also tended to not buy things for the house because it meant more things we’d have to pack up and move every time we relocated. Being a young academic is sort of like being a young ballplayer, or a member of the military. Many people live a few places doing postdocs or visiting assistant positions before finding a permanent spot. We moved to Kalamazoo, Michigan and then Fresno, California before settling here. I’ve always been into vintage stuff, and we’ve continued that thread into the house as well. It’s cheaper – and definitely more interesting to us – than buying new. I’ve found a number of things on ebay, and the guys at Mostly Mod have been kind enough to let Chimp take pictures and to email back and forth with me. Chimp, like me, likes old stuff, and he also takes a certain amount of pride in being “the weird people down the street.” And we are definitely accumulating some things to push us further into that category. Our two most recent ebay purchases are an enormous painting for the hall and a pair of lamps for the living room. The painting is a Vanguard Studios one. Vanguard Studios is an interesting story. 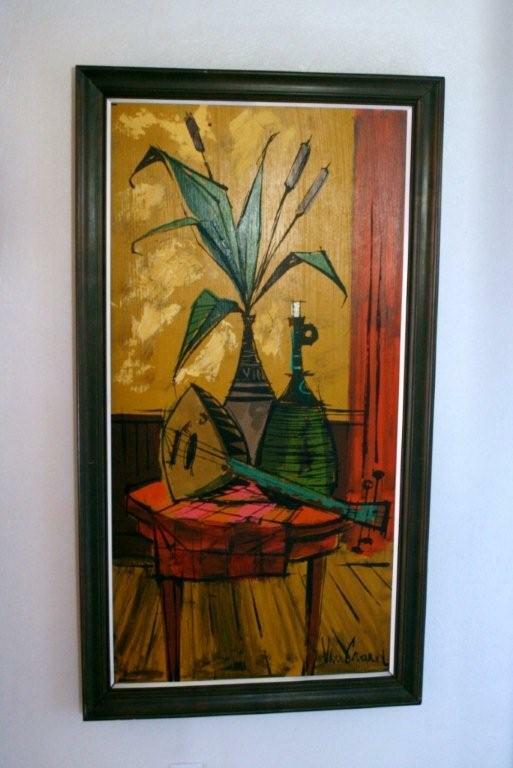 I knew I had seen the “Lee Reynolds” signature on thrift store paintings in the past, and when I saw one on ebay, I did a little more looking for information about the artist. Reynolds headed up Vanguard Studios starting in the 1960s, which produced thousands of what could fairly be termed “sofa paintings” – works in a fine-art style, produced assembly-line style by a staff of artists. The fleece and antimacassar are for the cats. The paintings bear a variety of signatures: “Lee Reynolds,” “Lee Burr” (Reynolds’s middle name), sometimes just “Reynolds.” It’s been fascinating to look at the paintings on ebay – you can very clearly tell exactly when they were painted, from the bold colors of the late 60s, to the earth tones of the 70s, to a stretch of abstract mauve-and-blue early 80s monstrosities. 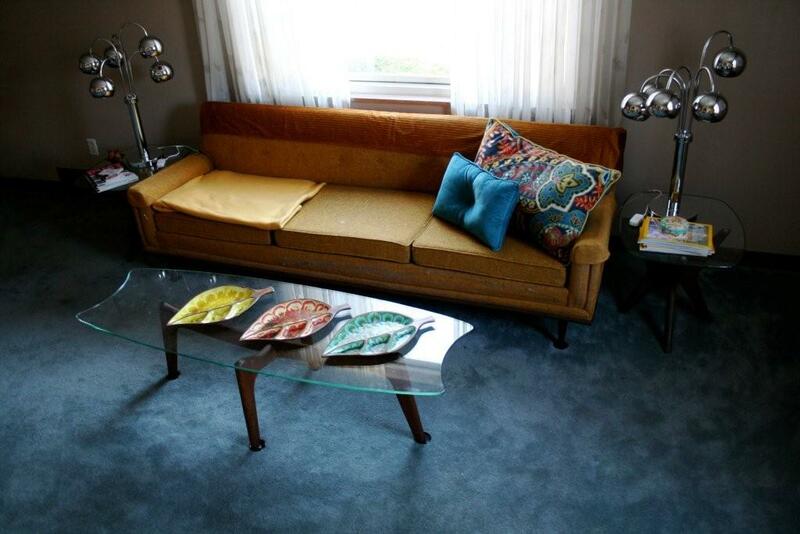 Our new acquisition is in the first category, and is a perfect match to the 1960s mustard-colored living room couch. Does this room have enough pillows? We also recently added a pair of lamps, above, to the living room. I have a serious weakness for chrome lighting of the Sputnik type, and these lamps have that in spades. These are replacing a pair of chrome column lamps that were a bit undersized for the room. Unfortunately, we haven’t been able to find fluorescent bulbs to fit these, so they will double as space heaters. 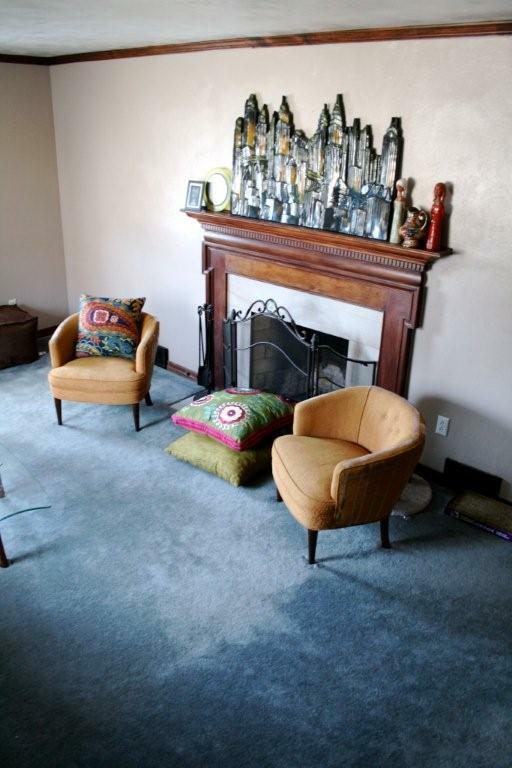 The addition of the painting has convinced me anew that when we have saved enough to reupholster the club chairs, we will do it in a near-electric blue that will coordinate well with the couch. If anybody has access to a good source for upholstery fabric, I’d love some help – it’s one of those things that the internet doesn’t seem to be good at yet. 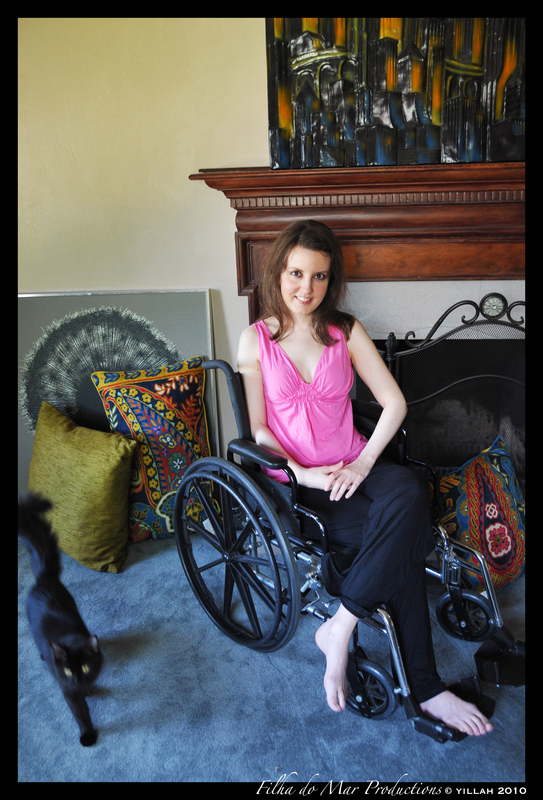 This entry was posted in House & Home, ME/CFS and tagged Chimp. Bookmark the permalink. Lovely! All hail the cozy nest! Thanks, Emily! It’s nice to be well enough to pick stuff out for it. Compliments on the lovely nest!